SURFING: Owen Wright has returned to the competition arena for the first time since sustaining a potentially career-ending head injury while surfing at Pipeline in Hawaii in December 2015. 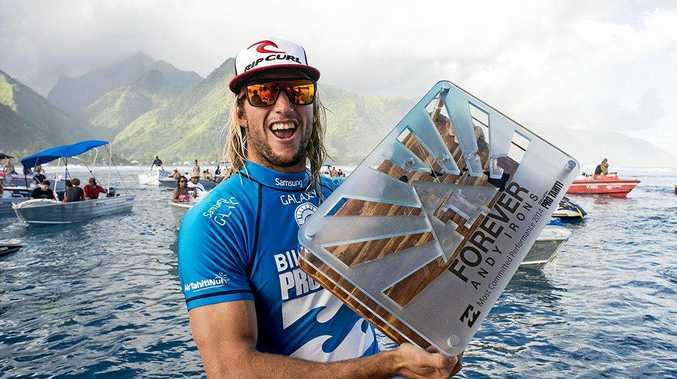 The appearance of the new dad in round 13 of the annual Maitland and Port Stephens Pro at Newcastle is a major step in his bid to return to the World Surf League tour this year. It took just three minutes for Wright to catch his first wave - a 6.10 - and show he still has the right moves to be one of the sports best. Wright opted for a low-key return to the competition arena after being given the go-ahead to surf again by doctors. Wright is the older brother of world champion Tyler Wright, who has been closely involved in his rehabilitation from the head injury, which resulted in him needing to learn how to surf again. Tyler Wright says her brother is her "inspiration". When she won the first event of the women's world tour at Snapper Rocks last year, a clearly ill Wright snuck down to the competition site to congratulate her. At the Maitland and Port Stephens Pro at Newcastle on Tuesday, Wright took on American Nathan Yeomans and Brazilians Luel Felipe and Alan Donato in the second round of the Surfest competition. Earlier in the event, Wright's good mate and defending Newcastle champion Matt Wilkinson was a shock elimination. Wilkinson, who led the world championship standings for a major part of last season, was beaten by Japan's Yuji Mori in the first heat of the second round.